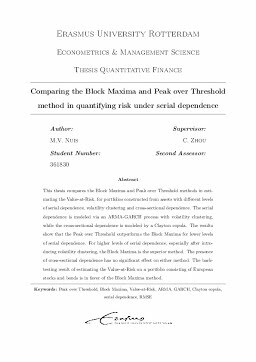 This thesis compares the Block Maxima and Peak over Threshold methods in estimating the Value-at-Risk, for portfolios constructed from assets with different levels of serial dependence, volatility clustering and cross-sectional dependence. The serial dependence is modeled via an ARMA-GARCH process with volatility clustering, while the cross-sectional dependence is modeled by a Clayton copula. The results show that the Peak over Threshold outperforms the Block Maxima for lower levels of serial dependence. For higher levels of serial dependence, especially after introducing volatility clustering, the Block Maxima is the superior method. The presence of cross-sectional dependence has no significant effect on either method. The backtesting result of estimating the Value-at-Risk on a portfolio consisting of European stocks and bonds is in favor of the Block Maxima method.